Lock in a great price for Aries Hotel & SPA – rated 9.5 by recent guests! This place was beautiful and comfortable! The staff was friendly and professional. Location is ideal! The included breakfast was more than I would every expect, excellent and tasty!!! Would highly recommend this hotel. Bedroom and bath were a generous size, with a comfy bed. The hotel even smells good. It is an excellent value for the money. We enjoyed the hot tub and the pool. The front desk staff were all exceptional. In particular, Premek went above and beyond expectations in his willingness to help us with our plans. The spa and pool were fantastic, with lots of different sauna options. Also, the restaurant was really superb. The pool and spa were fantastic -- all sorts of different saunas and facilities! Hotel was truly superb in all aspects. I highly recommend it to anyone. The location is perfect. Aries Hotel & SPA This rating is a reflection of how the property compares to the industry standard when it comes to price, facilities and services available. It's based on a self-evaluation by the property. Use this rating to help choose your stay! 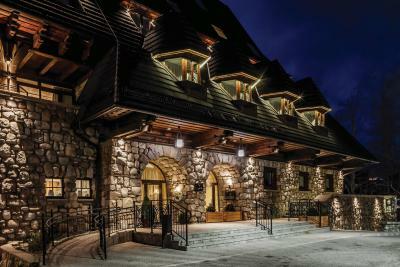 Featuring an indoor pool and a restaurant, Aries Hotel & SPA is in the ski resort town of Zakopane. The property is a 5-minute walk from the city’s high street of Krupówki. Free Wi-Fi access is available throughout the property. Each room is fitted with flat-screen TV and a minibar and features a private bathroom with either a bathtub or shower. A hairdryer and bathrobes are provided. Extras include a safe, bed linens and towels. The hotel features a fitness center and a wellness and spa center. Other facilities at the property include a ticket service, a tour desk and luggage storage. An array of activities can be enjoyed on site or in the surroundings, including skiing, cycling and hiking. There are numerous shops and restaurants within walking distance. Szymoszkowa Ski Lift is 8 minutes by car and the Zakopane Aqua Park is 6 minutes away. The Zakopane Train Station is just under 1 miles from the property. When would you like to stay at Aries Hotel & SPA? This twin/double room has air conditioning and bathrobe. This more spacious twin room has a bathrobe, seating area and electric kettle. This suite features air conditioning, electric kettle and tea/coffee maker. Please note that the suites have different sizes and the photos present only an example. This large suite has a balcony, tea/coffee maker and air conditioning. House Rules Aries Hotel & SPA takes special requests – add in the next step! Aries Hotel &amp; SPA accepts these cards and reserves the right to temporarily hold an amount prior to arrival. Aries Hotel & SPA accepts these cards and reserves the right to temporarily hold an amount prior to arrival. It was a cosy hotel with a special feel. My room was excellent as was the breakfast. BE AWARE - Do not allow Aries Hotel to lock a deposit from your card! They asked a deposit over the prepaid booking at check-in. Without telling me the amount they locked 350€ from my card. I was informed at check-out, that they released the amount and it will be back on my account in 2-3 days. After a week the money was still locked, my email was answered: "You don't have to worry, because it will be realeased for a couple of days." There was no more communication from them, no reply on my email for 3 more weeks. My bank cannot help until the hotel keeps the money locked. The spa and pool are were a little tired and could use a refresh. We enjoyed the all the aspects of the hotel. We found the hotel itself to be very nice. Our room on the top floor was amazing. We ate in the hotel for both breakfast and dinner And found them to be very tasty. We also enjoyed the spa and pool area. Staff at the reception is stiff and not friendly every time I visit. Fantastic. Increadible choice and quality. Friendly staff at the bar and restaurant (which is also great). Goof gym and spa. Loved the decoration. Lovely food and drinks. Right in the centre. The spa! Great location, super friendly & helpful staff. I got sick that it was very urgent to see a doctor and I needed to leave one day earlier they wouldn't refund me for this night but they didn't charge for 2 nights parking.